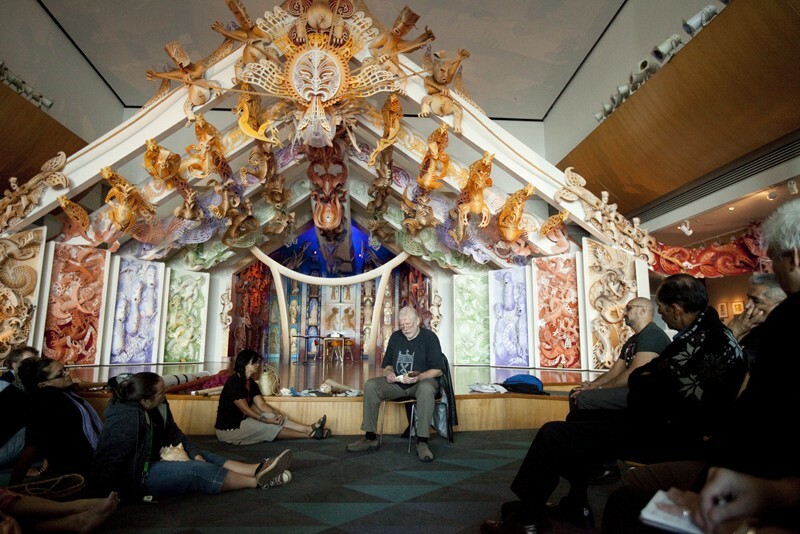 The staff in Te Papa’s taonga pūoro group are very lucky to have Richard Nunns as our mentor. Through his teaching and encouragement we continue to explore the kaupapa of taonga pūoro. Richard Nunns talks to Te Papa's taonga pūoro group, March 2010. Copyright Te Papa. Richard is an incredibly busy man, travelling throughout New Zealand and often overseas, involved in many different projects. If he has a spare hour and he’s in Wellington he comes to work with our group. 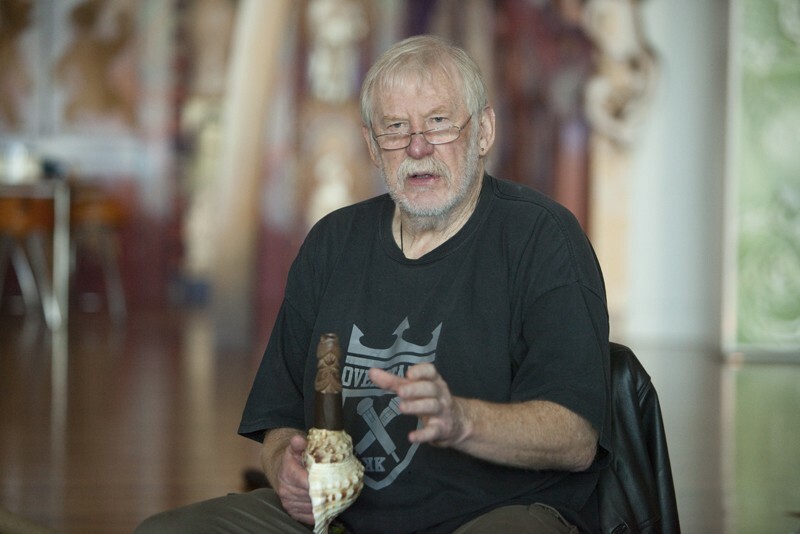 Recently he came to talk to us about the pūtātara and show us how it’s played. Richard Nunns talking about pūtātara on Te Papa's marae, March 2010. Copyright Te Papa. The pūtātara is a trumpet made from a conch, or triton, shell. It’s loud, signal call is heard more often these days, and is used to mark special occasions such as opening ceremonies. Conch shell trumpets are common musical instruments throughout the Pacific, such as this one from the Marquesas, in Te Papa’s collection. In Aotearoa New Zealand these shell trumpets have a wooden mouthpiece attached to the shell. The large conch shell species (Charonia tritonis) is not found naturally in New Zealand. A smaller, native shell (Charonia lampas) was used. It’s only in more recent times that large Pacific conches have been brought into New Zealand and used to make pūtātara. Learning to play the pūtātara well takes a lot of practice. It’s probably useful to have understanding neighbours! I found out that you need strong lips. After trying to sound a pūtātara for a while you get a strange buzzing feeling in your lips from all the vibrations. You also have to go away and work on your “embouchure” (a term trumpet and saxophone players will know) – which means how you form your mouth around the mouthpiece. 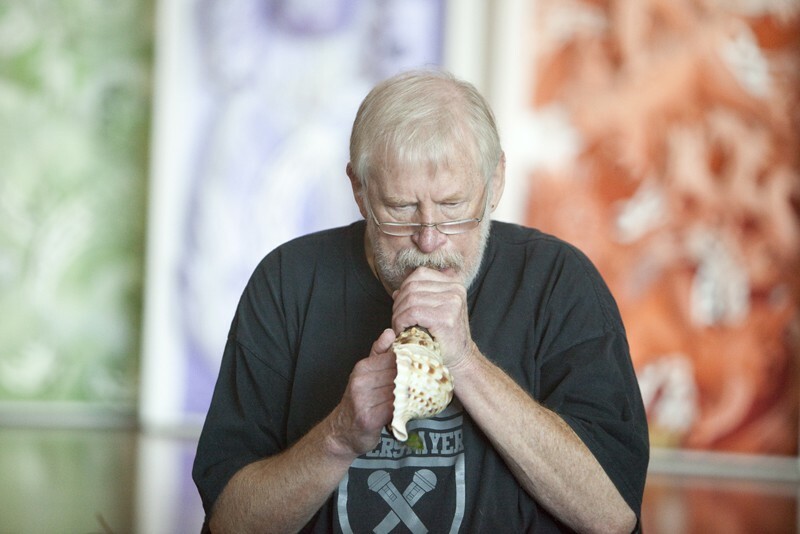 Richard Nunns playing a pūtātara, March 2010. Copyright Te Papa. As you start off playing the pūtātara it helps to give the sound a good punch, then try to sustain the note, and fade off slowly. As you get better at it you can shape the sound and make it more melodic, by using your hand placed inside the mouth of the shell. Each pūtātara is different and has its own, individual voice. Under Richard’s guidance the sound of pūtātara will continue to increase and grow at Te Papa – and for that we are truly grateful.